The Steam Link is a nice way to play PC games when you’re not at your computer. 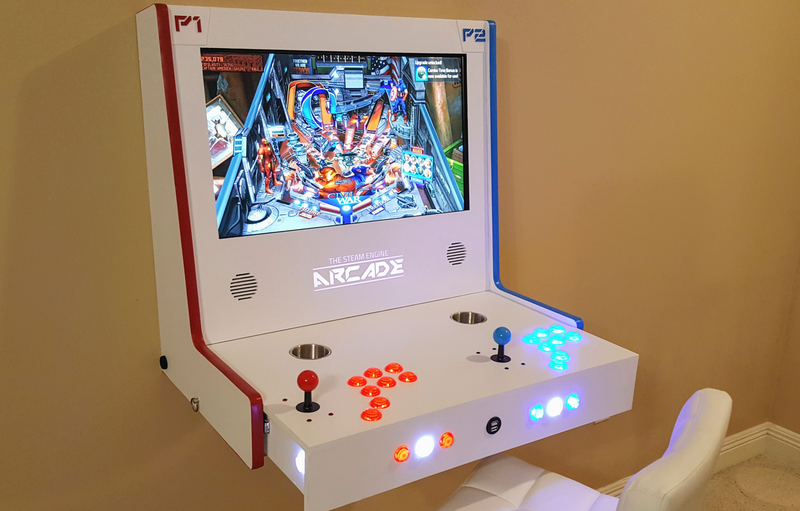 Usually people set it up in their living room to so they can play on a TV while sitting on the couch, but the device can be turned into a nifty arcade machine as well. After making a mockup of the planned tabletop arcade in the modeling program Fusion 360, he cut all of the pieces needed for it out of MDF panel (medium-density fibreboard). While he made it look easy on Imgur, you can see from the photos that a number of tools were involved, including a table saw, lots of ice clamps, and a CNC Machine (computer numerical control) that makes it easy to program cuts for curves, holes, and other complicated shapes. In the end it all came together very nicely, including not only cup holders, two joysticks and sets of arcade buttons, and a nice LCD display, but also additional USB ports and an assortment of colorful lights. The speakers, wires, and everything else are all stored behind the panels, with the Steam Link itself slotted into a little MDF compartment in the back. Inferno156 showed Castle Crashers and Marvel vs. Capcom 3 running on the machine, but since it’s streaming games from his PC, it could play anything else that’s in his game library. It’s certainly a much more creative and useful thing to do with your Steam Link than let it sit in a box of extra cables collecting dust like mine is. You can see more pictures of the project over at Inferno156’s post and look at some of his answers to people asking how to build their own over in the Reddit cross-post.